Stunning Jane. Wonderful colouring. Sorry you have been poorly and hope you feel better soon. Happy Anniversary and Easter Greetings. Adorable card, Jane. 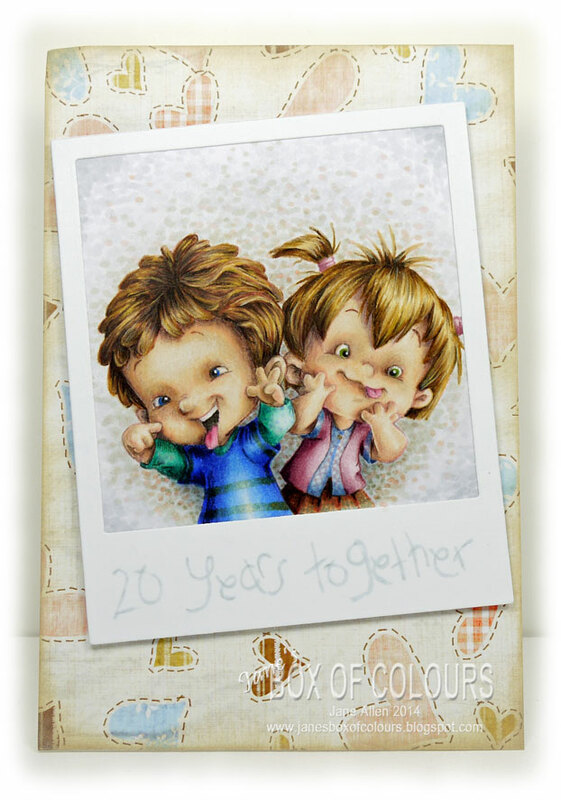 That image is so fitting for an anniversary card and sure to bring a smile to everyone who sees it. Happy Anniversary and many more! Love,love,love it! so beautiful, your colouring blows me away, what a perfect design too! WOW! Such a fabulous image and your colouring is amazing! I hope you are feeling better soon and Happy Anniversary for Thursday. So, so awesome! Congrats on 20 years!! 41 for us the end of June. Stunning colouring Jane. I love the image and design. Oh my gosh! You need to do some more tutorials on using pencils Jane. This is so incredibly dimensional. I feel like I could reach out and touch the stands of their hair. Stunning! Hugs and hope you feel better soon! That is too flipping funny!! LOVE it! Happy Anniversary and hope you are feeling better soon. Jane!! This is simply jaw-dropping! You are a coloring genius! Oh my goodness, I am in love. Your coloring is amazing. Oh my goodness that is amazing. Your coloring is out of this world.